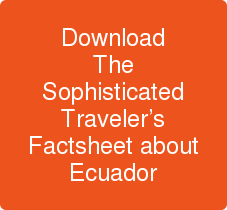 A stunning landscape of towering snow-capped volcanoes, mist-covered cloud forests, historic haciendas, and thrilling nature adventures make luxury vacations in Ecuador truly captivating. Just the thought of sightseeing through the Avenue of the Volcanoes aboard the gravity-defying Nariz del Diablo train, is an electrifying prospect. Luxury journeys showcase diverse fauna, bubbling hot springs, and pristine waterfalls. From the artisan workshops and colonial contrasts of Quito to the world-famous Galapagos Islands, Ecuador is a wonder to behold.